Before WILD DOG zine, Henry Weissborn, a sociology student at the University of Houston and President of the Direct Action Committee (Youth International Party/Yippie Chapter), edited the organization’s underground magazine ULTRA (1978-1979), which covered civil disobedience, gay rights, feminism, marijuana reform, anti-nuclear campaigns, and the counterculture. According to Weissborn’s “History of Houston Punk Rock Fanzines,” which was published in PUNX in 1986, there were no fanzines in Houston in 1978. The city’s only publications were ULTRA and THE TRANSIENT, a poetry and art magazine published by Richard Tomcala, who would later start PUBLIC NEWS. Both ULTRA and THE TRANSIENT were published on offset printers in runs of 500 copies or less. Three issues of THE TRANSIENT were published before it folded in late 1978, Weissborn said. In 1979, Weissborn booked New York’s Joy Ryder and Avis Davis to headline a Rock Against Racism (RAR) outdoor concert/event at the University of Houston. The Yipster organized show was cancelled at the university campus, and the lineup was rescheduled at Paradise Island. 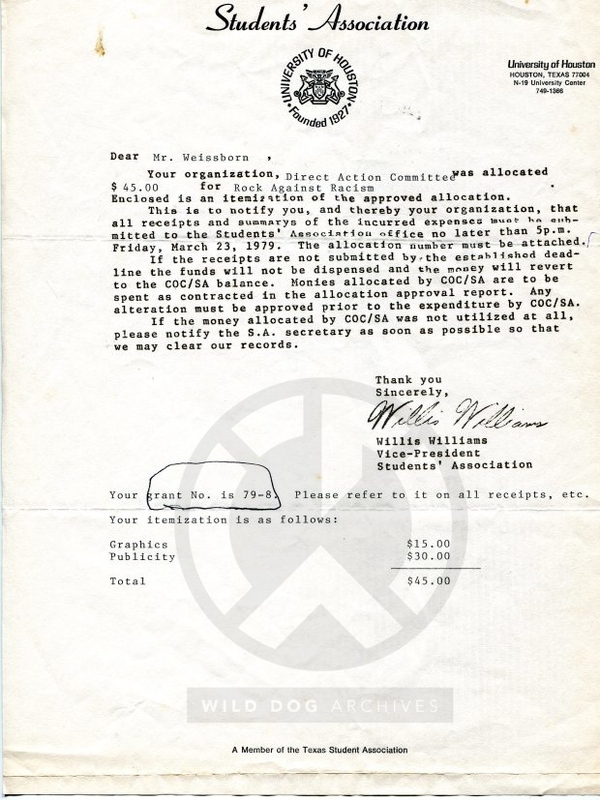 Houston’s first RAR concert was held on April 1, 1979 and featured Houston’s classic punk bands Really Red, Legionaire’s Disease, and Christian Oppression (The Hates). Vast Majority and AK 47 also debuted at the event. Houston’s youngest band at the start of the scene, teenage punks Vast Majority recorded their lone studio effort I Wanna Be a Number in March 1980 on Wild Dog Records. Henry Wild Dog, who helped produce the 7″ single, had a brief stint with the band as part of its second lineup. His contribution to gigs at the Island earned him the other DIY-inspired handle Henry BadGuitar. ULTRA #4, Weissborn’s last issue of the local Yippie! 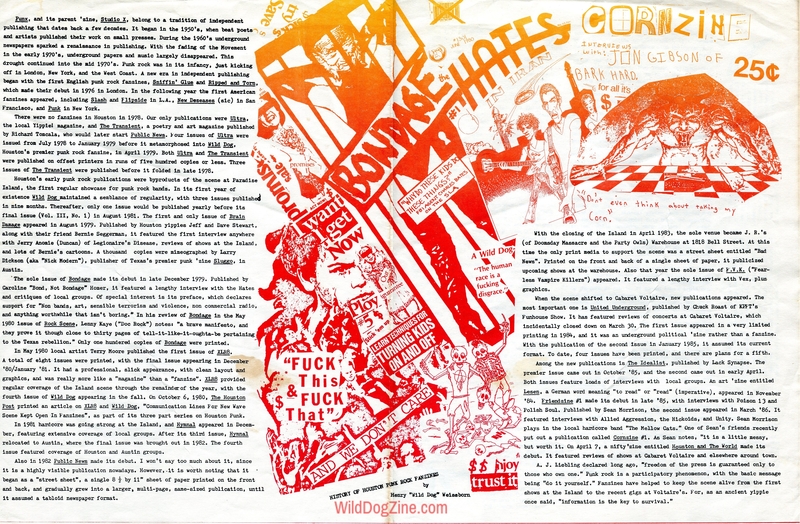 zine, covered Houston’s emerging punk scene in its last pages and notified readers about an April 1 “Be In.” Only weeks after the RAR showcase, WILD DOG #1 debuted in April 1979 as Houston’s premier punk rock fanzine. Houston’s early punk rock publications were byproducts of the scene at Paradise Island, the first regular showcase for punk rock bands. In its first year of existence WILD DOG maintained a semblance of regularity, with three issues published in nine months. Thereafter, only one issue would be published yearly before its final issue (Vol. III, No. 1) in August 1981. The first and only issue of BRAIN DAMAGE appeared in August 1979. Published by Houston yippies Jeff and Dave Stewart, along with their friend Bernie Seggerman, it featured the first interview anywhere with Jerrie Anomie (Duncan) of Legionaire’s Disease, reviews of shows at the Island, and lots of Bernie’s cartoons. A thousand copies were mimeographed by Larry Dickson (aka Nick Modern), publisher of Texas’ premier punk zine SLUGGO, in Austin.